Not busy with wire jewelry, though I wish it was. I am still way behind in so many things. September is coming to an end and soon it will be Christmas! Duh! Where have all the time gone??? Sorry I am repeating this question. Actually I would like to share the works of Pamela of Willow Walker Designs and Jennifer of Brain of Jen today. Pam makes fused glass, wire wrap and bead work. In her Etsy Profile, Pam says - I have a romantic, dreamy side that loves flights of fantasy, fairytales, princesses and science fiction-fantasy. 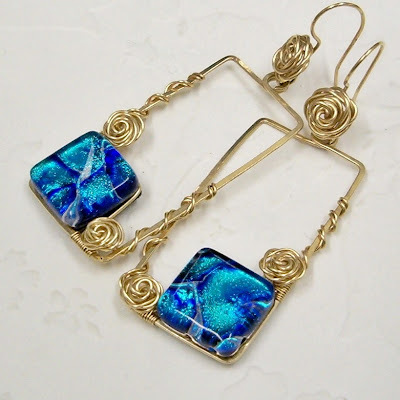 I think it shows in this pair of earrings that she made. Thank you for sharing this lovely piece of wire work Pam. This one here is Jen's Slave Bracelet. Jen likes to mix and match to create something new out of them. 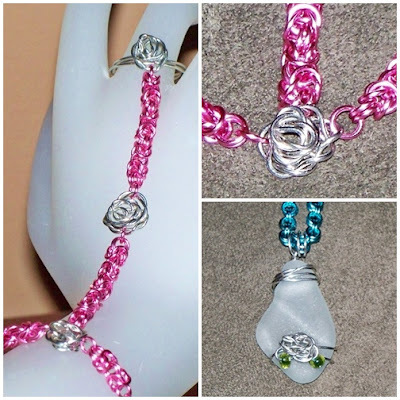 Using this wire wrap roses as "bead" is something new, even for me. Lots of potential there. Thank you for sharing and inspiring Jen. This is what creativity and inspiration is all about, don't you agree? Happy and productive weekend my dear readers! lol...believe me Mei...I understand how you feel. Sometime I don't know were the day went! Re: the copper pieces in my necklace...the double star color was created with a patina then it was coated with lacquer, so it won't tarnish...as for the pewter links and the chain the description doesn't say anything so I'm going to assume it will eventually change color...having said that I've had the pieces since April and they haven't tarnished yet which is a long time for copper not to tarnish...I'm thinking even though they don't say it they are finished somehow?? ?